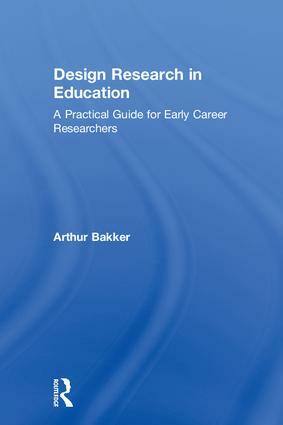 Design Research in Education is a practical guide containing all the information required to begin a design research project. Providing an accessible background to the methodological approaches used in design research as well as addressing all the potential issues that early career researchers will encounter, the book uniquely helps the early career researcher to gain a full overview of design research and the practical skills needed to get their project off the ground. Based on extensive experience, the book also contains multiple examples of design research from both undergraduate and postgraduate students, to demonstrate possible projects to the reader. The supervision of design research. Through its theoretical grounding and practical advice, Design Research in Education is the ideal introduction into the field of design based research and is essential reading for bachelor's, master's and PhD students new to the field, as well as to supervisors overseeing projects that use design research. Arthur Bakker’s clear logic helps to cut through the many questions and confusions that persist about DBR. This book offers an invaluable contribution to the literature by making DBR more accessible to research students and their supervisors. This book offers not only clear guidance about essentials of design research for novices, but also stimulating food for thought for experienced colleagues. Arthur is a careful and thorough researcher who writes clearly. In writing his book, he interviewed leading DBR researchers and scholars and shared draft chapters for feedback. I was honored to be one of them. I recommend it for your consideration. Arthur Bakker is a Fellow at the University of Bremen, Germany, and an Associate Professor at Utrecht University, the Netherlands.